Flavored olive oil can be a delicious way to season vegetables. Keeping herbs and spices in oil imparts flavor into every drop. That’s lucky considering sometimes all you want is a few drops. Trying to throttle back on the olive oil can be a delicate operation, and for that there is the Misto Gourmet Olive Oil Sprayer. 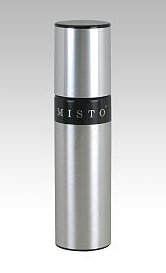 Featuring a brushed aluminum housing, the oil sprayer disperses contents without the use of chemicals or propellants. Standing at almost 8-inches tall, the handy kitchen gadget allows you to precisely control the amount of oil (flavored, or not) that you wish to use. Hey man. Like the blog so far, good job. Anyways, I have a question for you regarding candy coating machines.